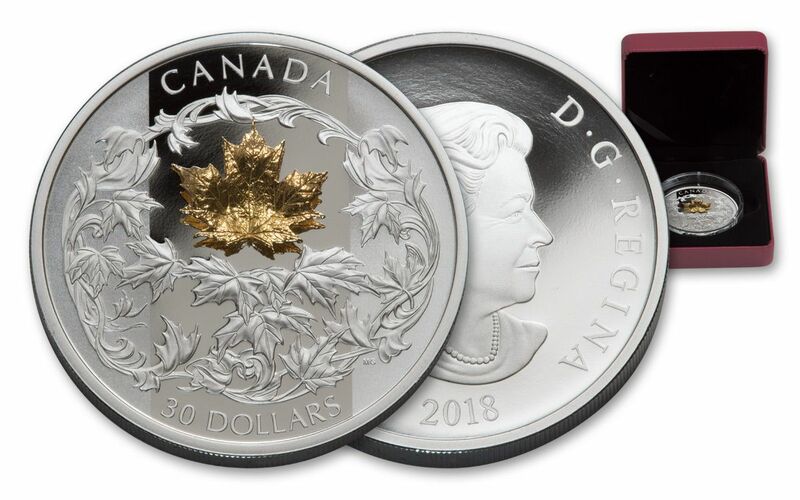 Canada's First-Ever Two-Ounce Silver Proof with an 18 Karat Gold Maple Leaf! We're betting that when you see a maple leaf, your mind immediately treks north to Canada. It's a symbol that's universally known, yet inseparable to a specific area of the world. Debuting as the central insignia of the Canadian flag in 1965 but serving as a national emblem since the 1700s, the maple leaf is held dearly by Canadians as a hallmark signifying pride, beauty, connection and community. So, it's no surprise that the Royal Canadian Mint (RCM) has made the maple leaf a signature design feature in the vast majority of their coinage. Their Maple Leaf bullion series is among the most popular and trusted in the world, and the artists of the RCM continue to interpret the symbol in imaginative and artistic ways. 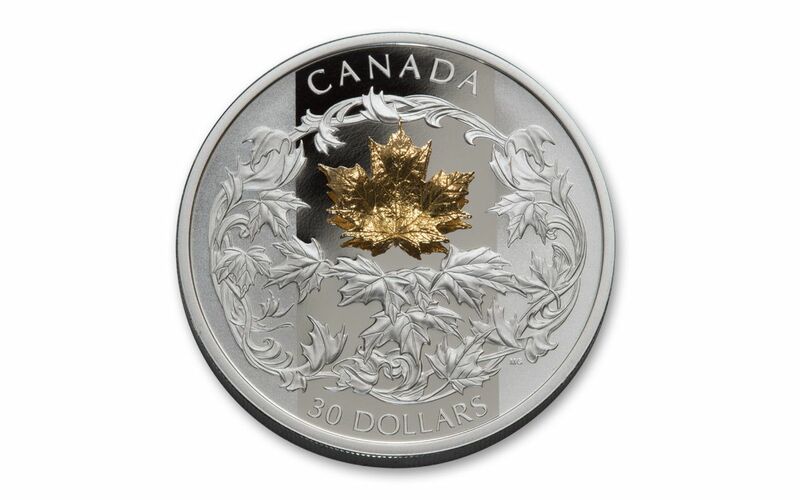 However, there's one thing that the RCM hasn't done with the maple leaf yet -- mint it with a gram of18 karat gold into two ounces of 99.99% fine silver -- until now! A WREATH OF MAJESTIC MAPLE LEAFS!-- Michelle Grant's gorgeously detailed design of maple leafs provides a perfect stage for this coin's golden centerpiece. Look closely, and you'll see that the field of this proof is cleverly frosted on each side, evoking the background of the Canadian flag with the golden leaf as its center. EXPERTLY PROOF-STRUCK-- The artisans of the RCM are known around the world for their craft. 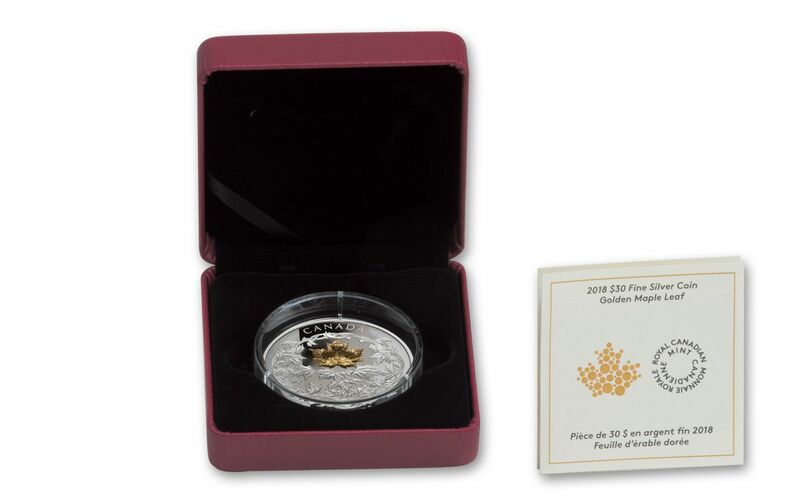 Beginning as a hand-selected, two-ounce planchet of 99.99% fine silver, each coin is struck multiple times by polished dies to create a proof of superb quality, seamlessly incorporating each coin's stunning gold maple leaf. 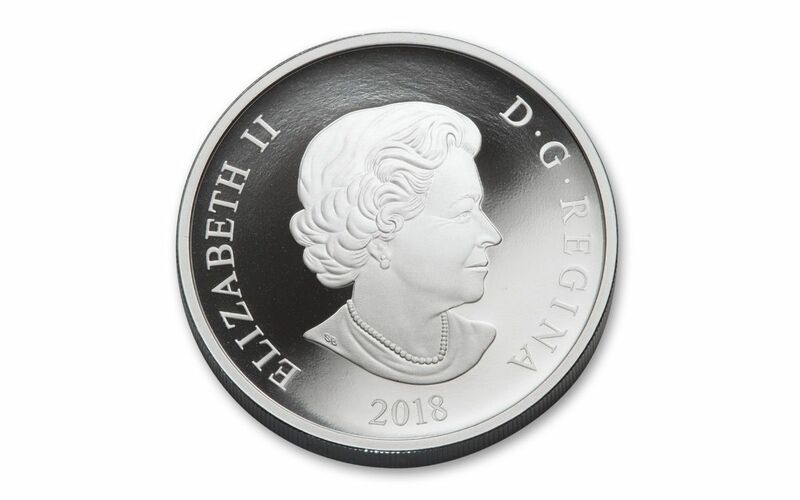 CANADA LEGAL TENDER-- Each 2018 Silver Golden Maple Leaf Proof is 30 dollars Canada legal tender, confirmed on both the coin's obverse and by Susanna Blunt's portrait of Her Majesty Queen Elizabeth II on the reverse. RCM-BRANDED PACKAGING-- Your proof will arrive to you in the exact same condition it had when it left the Royal Canadian Mint, housed in a maroon clamshell inside a black beauty box and accompanied by a certificate of authenticity. ALREADY SOLD OUT ON THE RCM WEBSITE! -- Limited to a mintage of only 2,750, this silver proof is already sold out on the Royal Canadian Mint's website! This gorgeous keepsake is bound to stir up memories of home for any Canadian. Whether you have a northern neighbor in your family or love great numismatic firsts, this coin is both a perfect gift and an ideal collection addition! Don't wait for this coin to fall out of sight -- rake one up for yourself today!